When I was little, my mom signed up to take a cake decorating class at a local bakery. I'm pretty sure it was sponsored by Wilton. I remember her baking a cake each week to take with her to class, and I remember she always came home with a decorated cake- which we (my sister and I) got to eat. It was cool for the first few weeks, but after that- we all kinda burned out on cake icing. I always had great birthday cakes. I remember the required barbie cakes (the ones with the real doll top and the cake part was a huge hoop skirt), the character cakes (for some reason I remember Big Bird and Strawberry Shortcake) and zillions of other cakes my mom made for other kids at school. When I got to high school, I used all of mom's equipment to make birthday cakes for all the members of Duran Duran. I still kinda remember all the birthdays. I think Simon Le Bon is next in early December. When I moved away, I took all my mom's cake decorating stuff with me. 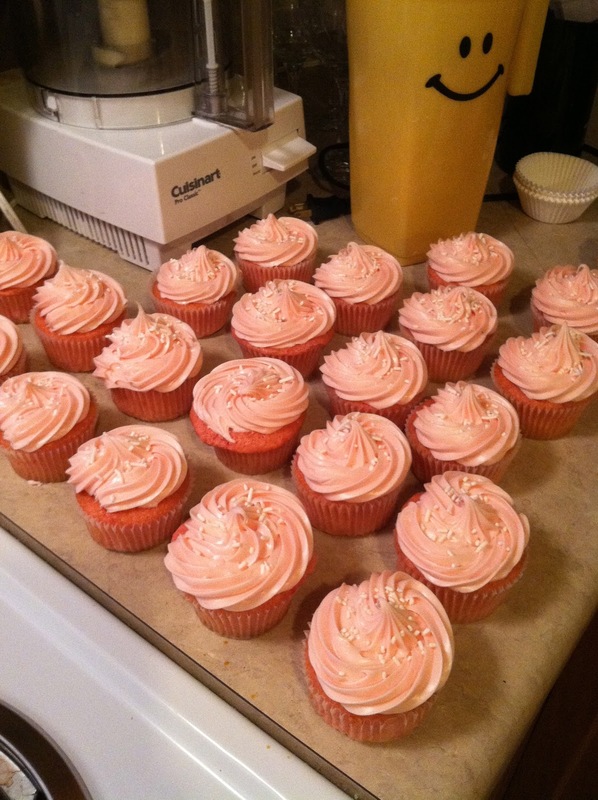 She doesn't do it anymore, and I do bake for my class and my friends, so rather than see it go to waste, I took it. And for the most part, all the tips (I think I have all of them) and equipment have been packed up in a box, out of the way since 2006. Because of the popularity of cupcakes, I have been thinking of getting out the box and trying my hand at decorating. Surely some of my mother's talent rubbed off on me, right? 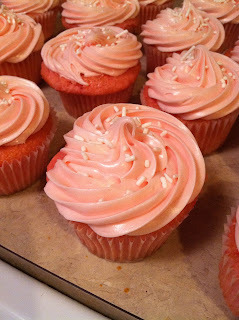 After reading several blogs, however, I realized that to make trendy cupcakes, I was going to need some new tips. These are gigantic, and they are designed to make the huge swirls of frosting on the tops of all those beautiful cupcakes. I found a source online the other day (Cupcake Social), and ordered a set of my very own. They arrived about 4 days ago. My husband teaches 5th grade. He has auctions for his class, so they can spend the "money" they earn at their "jobs." He usually asks me to bake something he can put on the auction block. Usually I send cookies or brownies. But this time- I was ready. I decided to make strawberry cupcakes with pink cream cheese frosting. Now- I didn't make anything from scratch. I really didn't have time. But I did get out my new decorating tips and give it the good old college try. They weren't perfect, but they were awfully cute. I even used the sample of white sugar sprinkles I got with my new tips. If you have any creative leanings in the cake decorating area, you really should give it a shot. It feels so creative, and you get to eat your work! Plus- people love to get baked goods as gifts. I highly recommend the company from which I bought my cupcake tips. They are very nice and I was very satisfied with my experience with them. I really like that it's an Etsy shop, because I love the idea of supporting small businesses. Now I'm chomping at the bit to bake again for Halloween. My mom gave me a chocolate/caramel cupcake recipe that will be perfect! These sound and look DELICIOUS! I might be asking for cupcake decorating lessons when things settle down a little.